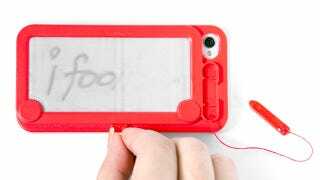 Before touchscreens and tablets came along, Magna Doodle was the easiest way for a kid to draw without a pencil and paper. Which is why somewhere deep down we have a soft spot for what is otherwise a ridiculous iPhone case. Its creators aren't trying to pull a fast one either. They realize the practical applications of this case are non-existant, and have dubbed it the iFoolish with hopes there's enough '80s nostalgia still in the world to bolster sales. And with a price tag of just $25 and an adorable mini magnetic stylus included, we think they just might be right. Besides, to be perfectly honest, it does look like a much faster way to jot down a phone number than unlocking your handset and creating a new contact.